Expert in the field of functional programming and global network development. Has a masters degree from ITMO, the information technologies university. Current head of several international projects. Has a decade of experience in industrial programming with a specific interest in mathematics and social science. Blockchain and cryptocurrency expert. Academy School of Blockchain is the world’s first accredited school that provides education in the field of blockchain development. Academy enables the future of blockchain projects worldwide by addressing the growing blockchain developer shortage. Academy is a member of the Southern Association of Colleges and Schools (SACS-CASI) and is an internationally recognized higher education institution. Serokell is a software development company that is primarily known for the development of the Cardano platform which currently falls in the top 10 cryptocurrencies by market cap. Serokell largely uses functional languages, especially Haskell. The company's strategy is to only work on projects that have a scientific base. Serokell is the key developer of the new generation Disciplina blockchain. Next Chymia Consulting HK Limited, an international consulting group in the field of blockchain and financial services. Cryptopay is an online wallet where users can easily store and spend their money in bitcoins, Euros, British pounds or US dollars. The users of DISCIPLINA platform will be able to issue a Cryptopay co-branding plastic card. HappyMod: Their team of cryptocurrency experts has all kinds of skills and abilities, providing a high level of service. Services include: technical project review, software development, community moderation & social media support, and more. Renaissance Digital Assets is a blockchain investment and advisory firm. It provides extensive ICO advisory services, primarily to the companies that they identified as a target for the investments. Kosmos Asset Management is a Sydney based investment management firm. It manages equity portfolios for wholesale investors only. Co-founder of Cardano, CEO of Next Chymia Consulting HK. Marketing, promotion and blockchain consultant in Asian market. 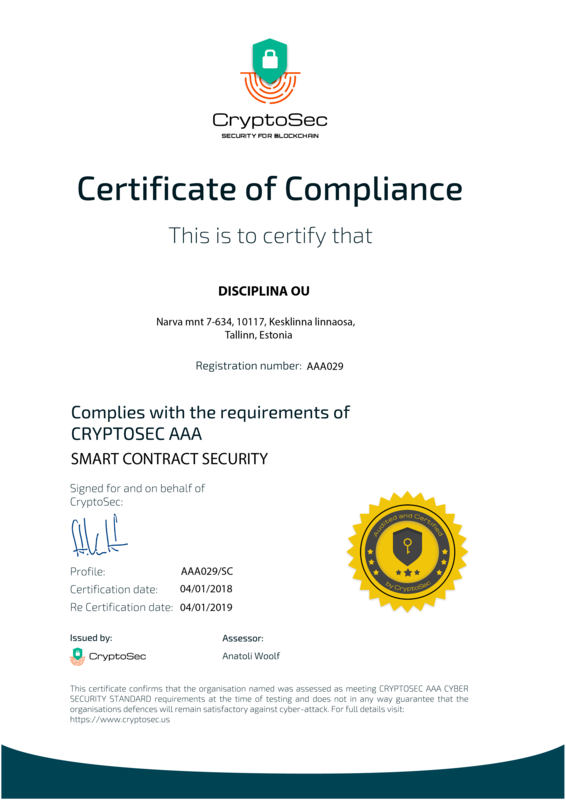 Sean’s Outpost and Unsung.org founder, cco-founder of the world’s first accredited school of blockchain named Academy. Jason is a pioneer in applying blockchain technology to humanitarian work. He is also working on a way to combat the shortage of blockchain developers. His hobbies are travelling, charity and evangelizing for blockchain technology. Has vast experience in training and coaching acquired in a progressive career across the banking, retail, real estate and FMCG. Antonio is also a professional in fields of employer branding, recruiting and HR. He has a Degree in Law and a Master Degree in Banking and Finance. He is exceedingly resourceful and gifted with a natural talent for blending both people and results. Financial expert. CEO of Cryptopay – provider of digital wallet services with functionality for storage and use of cryptocurrencies. „I’ve been predicting that by 2030 the largest company on the internet is going to be an education-based company that we haven’t heard of yet"
DISCIPLINA is a multifunctional blockchain for projects in the educational and recruiting spheres. 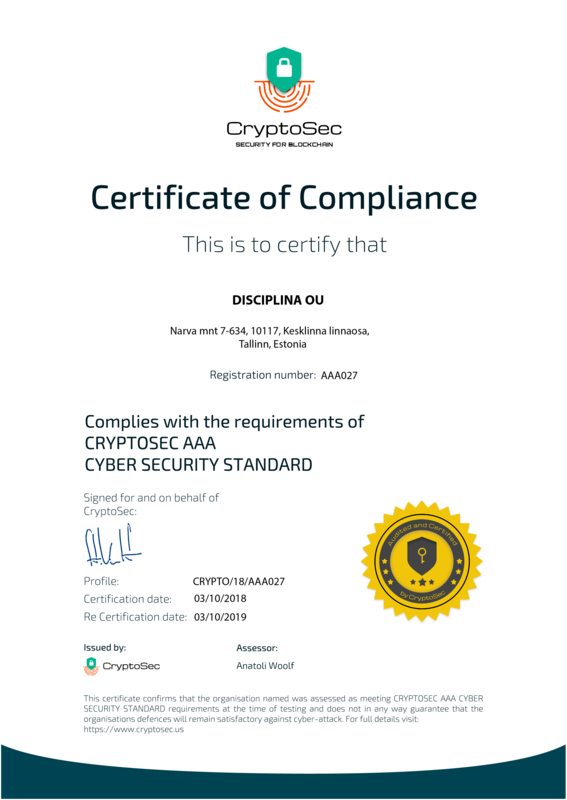 It provides the transparency of work and creates conditions of maintaining confidentiality and reliability of information added by system participants. DISCIPLINA doesn’t use any other blockchains in its work, and is being developed for the demands of the educational and recruiting fields, taking into account the specificity of their work. DISCIPLINA unites students, educational institutions (including private tutors), employers and recruiters. The users will interact with each other and the DISCIPLINA platform through applications with a convenient interface, providing a wide range of platform functions. Disciplina is a proof-of-stake blockchain, which means faster transactions and no need for energy-consuming mining farms. We do not require stake delegation — any node is free to join the network and validate transactions. In order to increase participation in the protocol, we offer rewards for nodes that stay online and produce blocks. The probability of such a reward is proportional to the stake of the participant. DISCIPLINA respects privacy — it has private and public layers in its architecture. These layers work closely in order to guarantee both privacy and validity of the data. Private layer contains the actual data, whereas the public one stores cryptographic proofs that the data is untampered. We do not use any central organisation to tackle fake educational institutions. Instead, we integrate an intrinsic reputation mechanism called Web of Trust into the core of our architecture. Every entity is able to express opinions on the others’ ability to assess skills. The system builds the ratings of the participants based on these opinions. Respected educational institutions would have more weight and influence in our ecosystem. DISCIPLINA implements a novel data disclosure algorithm that preserves privacy and ensures that educational institutions can’t cheat while disclosing the data. We use blockchain as a final judge that decides whether the data being disclosed to the interested party is valid. Most importantly, it does not require opening the sensitive data to the public! With blockchains and cryptocurrencies one small error can cause big damage. This is why we prefer high-assurance software development techniques. Our core blockchain code is written in Haskell — a type-safe functional programming language that catches most of the errors at compile-time. We also value formal specification — it helps us create a clear understanding about how our system should work, and allows us to clarify all the subtleties of implementation before we even start implementing a feature. The reward to minters will come both from a part of the commission earned on transactions, and in tokens from the technical pool. The size of the reward distributed from the technical pool will continuously be reduced in such a way that the pool itself will never run out. Please read the Monetary Policy paper to know more about the technical pool. Using the Web of Trust, the users will be able to set the level of trust in each other themselves. To protect the system from fictitious educational institutions, DISCIPLINA has an inbuilt Web of Trust, analogous to PGP, in its protocol. Each user will be able to choose the system participants they trust. The level of trust in the other system members will be calculated individually for each user. Our network thus has no “verification centres”, which have an unlimited right to register or refuse the registration of an educational institution. Our Web of Trust will allow recruiters to know which educational institutions are worth cooperating with and which are not. The value of the grade given to the student will depend on the rating of the educational institution at the time the grade was awarded. When it comes to the sale of the private data, it is important to guarantee the integrity of such deals. Our team has developed the protocol that guarantees the transmission of the valid data in return for a transaction in cryptocurrency. When an educational institution sends data that has not been verified in the public blockchain (for example, if student’s grade was updated) to the buyer, the buyer doesn’t lose his money, but it is the educational institution that is fined a fixed amount. At the same time, there will be no disclosure of the transmitted data to third parties, since only the anonymised invalid part of the data has to be disclosed. To check the validity of transactions in public chain, so-called «Witnesses» will use a consensus algorithm based on Proof-of-Stake technology, which provides the high speed and low price of transaction. The report on PoS algorithm actualisation is delineated in greater detail in the technical documentation of the project. The Witnesses, as in other cryptocurrencies, will be rewarded for the launch of each block with commission fees from transactions made in that block. The probability that the Witness will become the block-leader is proportional to the number of tokens on his account. Student will be able to fully or partially deny access to his personal data. User personal data is stored on the private chains of the educational institutions. The public part of the network has only hashes of this data. Thus, private data remains reliable and safe at the same time. The DISCIPLINA architecture stores the data on student academic achievement on the private chains of educational institutions. This could cause the problem of data unavailability in the event that that educational institution stops using the network or that their equipment malfunctions. DISCIPLINA solves this problem by also storing the copies of all the data in student’s personal profile – thus it will be easy to prove the authenticity of the data by accessing the old records in public chain and checking the hashes. DISCIPLINA is an open-source blockchain. Any educational or recruiting service will be able to use it in their projects that store and process the personal data. The functions of the platform will be performed through the DISCIPLINA node. The platform will provide the public API for the convenient interoperation of the services with the DISCIPLINA nodes.